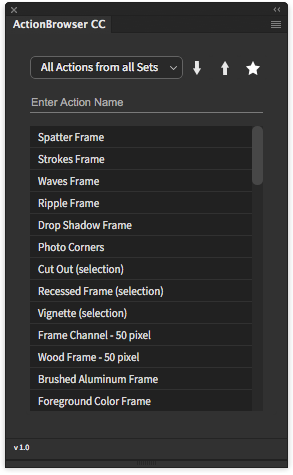 Search, manage and play your Photoshop Actions more efficiently than ever before. and arrow down. Play an action by pressing Enter. with a simple drop-down list. by clicking the arrow buttons. a click on the star button. THE TOOL we've been waiting for years. 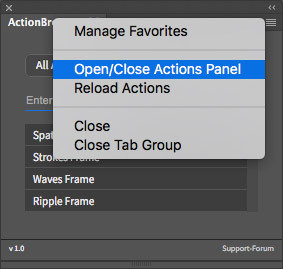 No matter how many actions you have installed - find with this panel and play the requested action with a few keystrokes. Even without using your mouse. An indispensable workflow accelerator! more efficient than ever before. One-time payment. Incl. the country-specific tax. Which version of Photoshop is required? 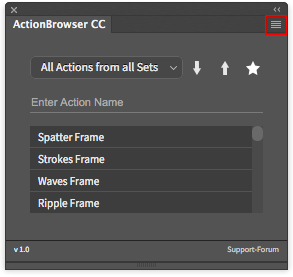 ActionBrowser CC runs under Photoshop CC 2014, CC 2015, CC 2015.5, CC 2017 and CC 2018! Older versions (CS6 and older) are not supported. How do I receive the panel? Once the purchase is complete, you will receive an email with a link to download ActionBrowser CC. On how many computers am I allowed to use the panel? You can install the panel on all computers, where the panel will be used by you. If a third person also wants to use the panel, a second license is required. How do I install ActionBrowser CC? Installation is fast and easy with its own installation file. For detailed instructions, check the text file in the downloaded zip archive. Can the search box be called with a keyboard shortcut? After the shortcut has been assigned, the panel can be called. If the panel is already open press the keyboard shortcut twice. The search field is now active and you can start to type and search your desired action. How can I create Favorites? With a click on the action name the action will be marked as favorite (white star). The button “Save” brings you back. How can actions be recorded? This will be done with the original Actions-Panel. 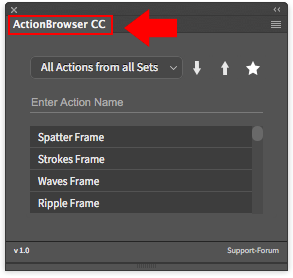 After a new action has been recorded, Action Browser CC must initialize them. See next question. 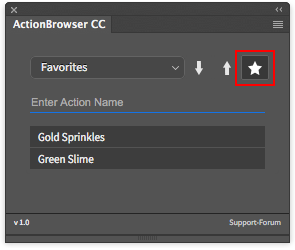 How are newly recorded actions in Action Browser CC recognized? 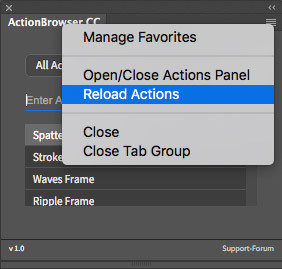 Restart ActionBrowser CC. This also works with two double clicks on the head of the panel. How do I continue my work in Photoshop after an action has been played? After an action has been played, the focus continues to be on the panel. This means you could play the same or another action again. By clicking on a tool in the toolbar or by pressing “Esc”, the focus is again in Photoshop. Please post in the support forum. I will respond to all inquiries as soon as possible. This truly a wonderful tool. It really speeds up my work in photoshop. Real easy to setup too! Does what it says - Allows logical ordering and rapid access to a growing list of actions that makes it cumbersome to locate something specific. Improves PS efficiency. Good panel to have. 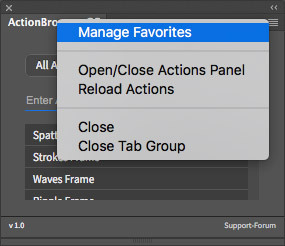 The only thing that saves more time than using Photoshop Actions is being able to find them in a split second. I'm so glad this plugin exists, it makes my work so much easier. It makes things a lot easier when working with lots of actions in Photoshop. OMG! This is probably my most favorite Photoshop tool. This plugin has saved me literally hours searching through my actions. I have never been able to figure out why Photoshop never added an "action" that would put your actions in alphabetical order. This one is even better than just alphabetical order. Thanks so much for creating this plugin! This is a life saver for sorting through hundreds of actions and finding what I want quickly. It takes a few seconds to initiate, but is super fast after that. I tested the trial before I purchased. Well worth the cost to save so much time in my workflow! Just what i need!! Save's a lot of time!! Der Action Browser CC ist auf alle Fälle eine sehr wirksame Vereinfachung des Wporkflows, er ist übersichtlich, schnell, wirklich gut gemacht usw. Allerdings verwende ich ihn als Amateur bisher nicht all zu häufig. Aber vielleicht wächst der Appetit mit der Zahl der Anwendungen. Absolut zu empfehlen. Aktionen sind nun wesentilch leichter und schneller aufzufinden. Einzig, es wäre schön wenn oben im Auswahlmenü eine alphabetische sortierung möglich wäre. Love it, saves me a lot of time as I have many actions. Two things I wish it had - when calling the actionbrowser would be nice to start typing instead of clicking on the search field to find an action. And 2 I wish after an action is played the actionbrowser closes so you can work on your file right away without having to click ESC or clicking on the file itself. Other than that I love this time saver and well priced too, best investment if you have a lot of actions and you don't want to waste your time. Sehr nützlich, weil endlich Übersicht in die Aktionen kommt! Um schnell Aktionen zu finden und ablaufen zu lassen, benutze ich den Action Browser. Die Favoriteneinteilung erleichtert ungemein das schnelle Finden der Aktionen. Diese PlugIn kann ich rund um empfehlen. Wenn ich Aktionen verwende, arbeite ich mittlerweile ausschließlich mit "ActionBrowser CC". Dieses Tool ist wirklich jeden Cent Wert. Da es immer etwas zu verbessern gibt, vergebe ich "nur" 4 Sterne. Ich kann jedem, der Aktionen verwendet, dieses PlugIn bestens empfehlen. Sehr gut gelungen der ActionBrowser CC. Einfach zu bedienen und die Aktionen sind super schnell zu finden. Der ActionBrowser CC hat sich für mich gelohnt. the tool I have been looking for! This is a great tool to break your actions free from the limited functionality of the Action panel. I love the straight forward organization and the ability to save actions as a Favorite. This is a must have! 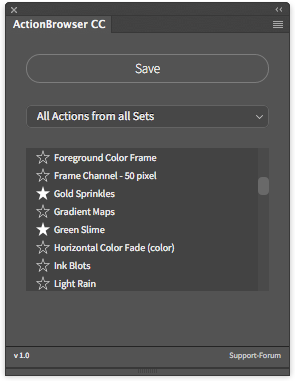 This cute little tool solves for me two quirks I have with Adobe´s cation panel, which is unfortunately a single panel for both creating/editing actions and for playing them: First, I have always to cope with all actions. It is sometimes confusing to find the action wanted within my actions, because I have many of them. Second, for some reason adobe sometimes? Expands action being played, exposing all single steps to me. This makes the action search even more confusing and raises the chance I disable a step within an action by clicking on it unintentionally, later wondering why this action does not work anymore. What I wished more? • Right-click on an action could offer toggling it´s “favorite” state. • Favorites, currently a single flat list could have some kind of structure. At it´s very best it would consist of action set trees, allowing me to organize my action by purpose, e.g. Landscapes-> landscapes color corrections Landscapes-> landscapes sharpening methods portraits -> portraits color corrections. Single action could be contained within several branches, e.g. Dodge&Burn would fit well both below “landscapes->contrasts” and below “portraits->contrasts”. I´d rated current version (1.1) with 4 stars, BUT Thomas delivers a no-nonsense support, he listens to his customers and has future plans, including some kind of favorites structuring. Because of this I rate his tool five stars. I have struggled when processing images to remember and find actions that I need to complete the look called for at the time. When I purchased Actionbrowser all trial and error clicking actions that were similar but not what I wanted stopped. Actionbrowser organizes and quickly lets me select the proper tools do use and by category or word search. I cannot image developing images in the future without this wonderful product! Still reading, what more do you need to know? Go download it now! 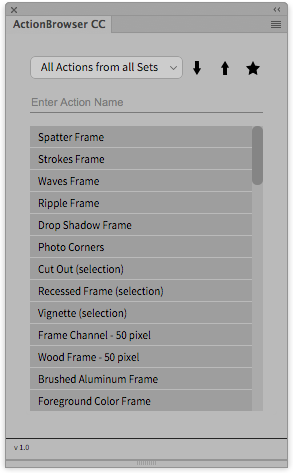 This little helper is a great friend when it comes to PS actions. When they start to grow in countless number on you, and they very soon do, ActionBrowser CC is there to keep everything a little easier to handel. Recommended!